The tallest mountains ever seen on Titan -- coated with layers of organic material and blanketed by clouds -- have been imaged by NASA's Cassini spacecraft. "We see a massive mountain range that kind of reminds me of the Sierra Nevada mountains in the western United States. This mountain range is continuous and is nearly 100 miles long," said Dr. Bob Brown, team leader of the Cassini visual and infrared mapping spectrometer at the University of Arizona, Tucson. 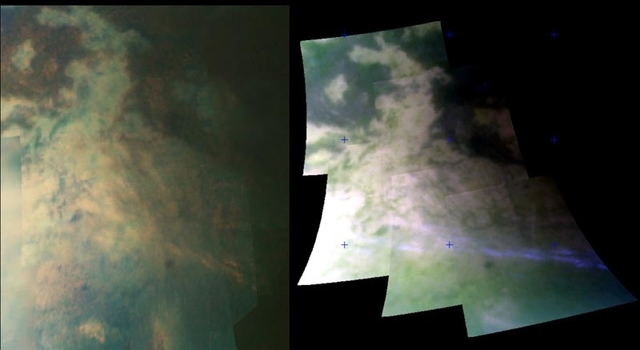 During an Oct. 25 flyby designed to obtain the highest resolution infrared views of Titan yet, Cassini resolved surface features as small as 400 meters (1,300 feet). 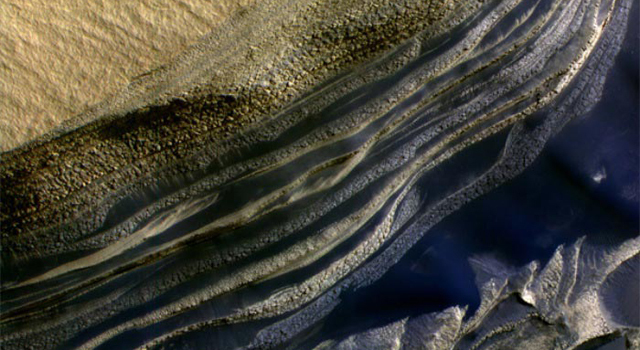 The images reveal a large mountain range, dunes, and a deposit of material that resembles a volcanic flow. These data, together with radar data from previous flybys, provide new information on the height and composition of geologic features on Titan. If Titan were Earth, these mountains would lie south of the equator, somewhere in New Zealand. The range is about 150 kilometers long (93 miles) and 30 kilometers (19 miles) wide and about 1.5 kilometers (nearly a mile) high. Deposits of bright, white material, which may be methane "snow" or exposures of some other organic material, lie at the top of the mountain ridges. "These mountains are probably as hard as rock, made of icy materials, and are coated with different layers of organics," said Dr. Larry Soderblom, Cassini interdisciplinary scientist at the U.S. Geological Survey, Flagstaff, Ariz. He added, "There seem to be layers and layers of various coats of organic ‘paint' on top of each other on these mountain tops, almost like a painter laying the background on a canvas. Some of this organic gunk falls out of the atmosphere as rain, dust, or smog onto the valley floors and mountain tops, which are coated with dark spots that appear to be brushed, washed, scoured and moved around the surface." The mountains probably formed when material welled up from below to fill the gaps opened when tectonic plates pull apart, similar to the way mid-ocean ridges are formed on Earth. Separately, the radar and infrared data are difficult to interpret, but together they are a powerful combination. In the infrared images, one can see the shadows of the mountains, and in radar, one can see their shape. But when combined, scientists begin to see variations on the mountains, which is essential to unraveling the mysteries of the geologic processes on Titan. 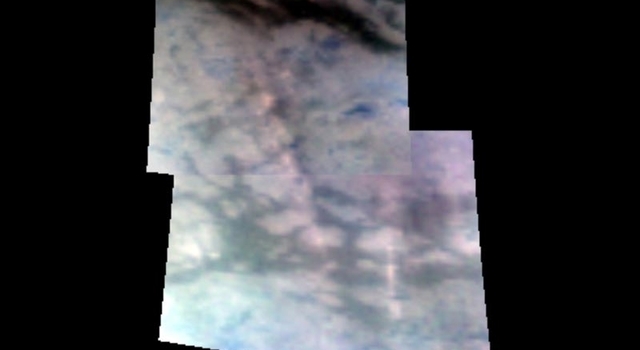 A fan-shaped feature, possibly a remnant of a volcanic flow, is also visible in the infrared images. The radar instrument imaged this flow and a circular feature from which the flow seems to emanate on a previous flyby, but not in this level of detail. "The evidence is mounting that this circular feature is a volcano," said Dr. Rosaly Lopes, Cassini radar team member at NASA's Jet Propulsion Laboratory, Pasadena, Calif. "With radar data alone, we identified it as a possible volcano, but the combination of radar and infrared makes it much clearer." Near the wrinkled, mountainous terrain are clouds in Titan's southern mid latitudes whose source continues to elude scientists. These clouds are probably methane droplets that may form when the atmosphere on Titan cools as it is pushed over the mountains by winds. The composition of dunes that run across much of Titan is also much clearer. "The dunes seem to consist of sand grains made of organics, built on water-ice bedrock, and there may also be some snow and bright deposits," Brown said. Titan is a complex place and scientists are uncovering the secrets of the surface, one flyby at a time. Scientists hope to get more clues from the next Titan flyby, on Dec. 12. For the new infrared images of the mountains visit: http://www.nasa.gov/cassini and http://saturn.jpl.nasa.gov and http://wwwvims.lpl.arizona.edu . Additional information on NASA news from the American Geophysical Union conference is at http://www.nasa.gov/agu . The Cassini-Huygens mission is a cooperative project of NASA, the European Space Agency and the Italian Space Agency. The Jet Propulsion Laboratory, a division of the California Institute of Technology in Pasadena, manages the Cassini-Huygens mission for NASA's Science Mission Directorate, Washington. The Cassini orbiter was designed, developed and assembled at JPL. The Visual and Infrared Mapping Spectrometer team is based at the University of Arizona where this image was produced. The radar instrument team is based at JPL, working with team members from the United States and several European countries.